Each hour-long webinar offered an information-packed presentation followed by a moderated Q&A where attendees posed their own thought-provoking questions. This series was complimentary to IDSA members and available at a low fee to non-members. For more information on this series, please contact us at idsa@idsa.org or 703.707.6000. When commissioning an industrial design, clients often think they want to provide a “blue-sky environment” in order to achieve the most creative design solution. This is a great approach until reality sets in. Real projects have budgets, schedules, platforms, manufacturing requirements and other constraints that typically define the project’s outcome. Fortunately, the most satisfying projects to design tend to be those where the “playing field” is the most narrowly defined. It is these constraints that inspire creativity. How can product design transform commonly understood forms into exciting original innovations? How can product design convey meaning that will attract a loyal consumer audience? How you can ensure your design process is profitable and your product is commercially successful? Emergence of populist design, including Kickstarter campaigns, crowdsourcing, and crowdfunding, through which there is an exchange of control over money, design outcome, and design success. Exchange between technologies. How can we produce individually-designed objects on a large scale, but still maintain a non-mass-produced feel? Customized design will lead to greater success of product adoption. As connectivity and ‘smart’ technology become increasingly popular, product design and development demands more than just industrial design expertise. Connected products that bridge the physical and digital worlds are growing in number and market share with little sign of slowing. Agencies wanting to compete in this changing marketplace will have to evolve along with the products they design. This webinar will look at the unique issues and opportunities facing teams designing convergence oriented solutions. Taylor will share challenges faced and lessons learned in building an agency focused on enabled products. Participants will come away with a different and deeper understanding of workflows and processes; the influence various disciplines can have on each other; collaborating with clients on convergent products; and the talent and recruitment challenges presented when hiring for a multi-disciplined team. The skill sets used by successful entrepreneurs and industrial designers share many common elements. 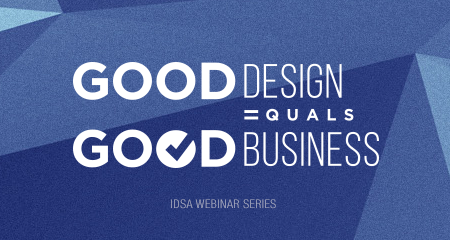 This webinar will draw parallels between the ways that good design helps build businesses, and opportunities to adapt industrial design into business skills to help create and grow startups. Drawing from case studies of software startups as a platform for the discussion, Lehtiniitty will deep-dive specific areas in which these skills and connections can be transferred to companies in different spaces. Participants will take away greater knowledge of optimal decision-making and design choices that positively impact the bottom line of the business. Those specifically interested in entrepreneurship will take away an understanding of how to leverage their own skill sets to maximize the probability of success in their entrepreneurial endeavors. Everyone is looking for the next big thing. Entire businesses are built upon truly new and engaging products. However, there is a tendency in both design and business to look for inspiration in the category for which we are designing. Understanding competitors and the opportunity for creating difference is important, but the inspiration part, that special “something” will likely come from somewhere else. This webinar will explore how attributes in non-related categories can provide inspiration for the development of a new technology or the metamorphosis of your process leading to design and business success. Participants will learn new approaches to break down product attributes, provide relevance and adapt the learning to create new product platforms. How can you tap previously overlooked opportunities for inspiration to design the next winning product? What does scrapbooking and flooring installation have in common? Join the discussion and find out.